The 3D printing revolution hit the globe a couple of years back, and 3D printers have come a long way since then. Out with the bulky industrial-looking machines, in with smaller, well designed ones. 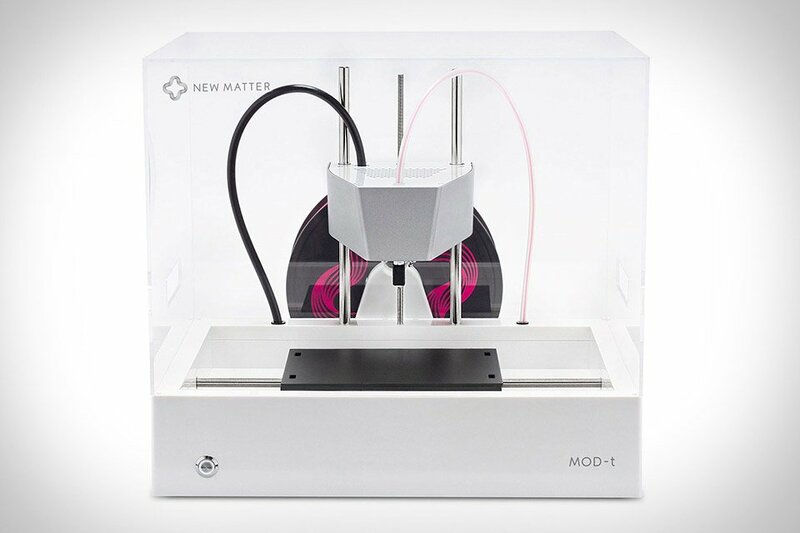 The New Matter MOD-t Desktop 3D Printer is a sleek, fair-sized gadget that’s both cool looking and conveniently simple to use. Its white base is covered by a transparent plastic hood that shows you the printer’s moving build plate and extruder at work. It takes just 20 minutes to set it up, and allows wireless printing from your computer, tablet or smartphone. And guess what? They’re eco-friendly thank to their eco-friendly PLA filament! Customized and tailor-made are all the trend. Customers request colors, shapes, features they prefer in almost every industry now. Card and bikes too. Some really cool motorcycles have come out of custom requests, and what’s even cooler, is when custom bike builders create their own customized motorcycle. 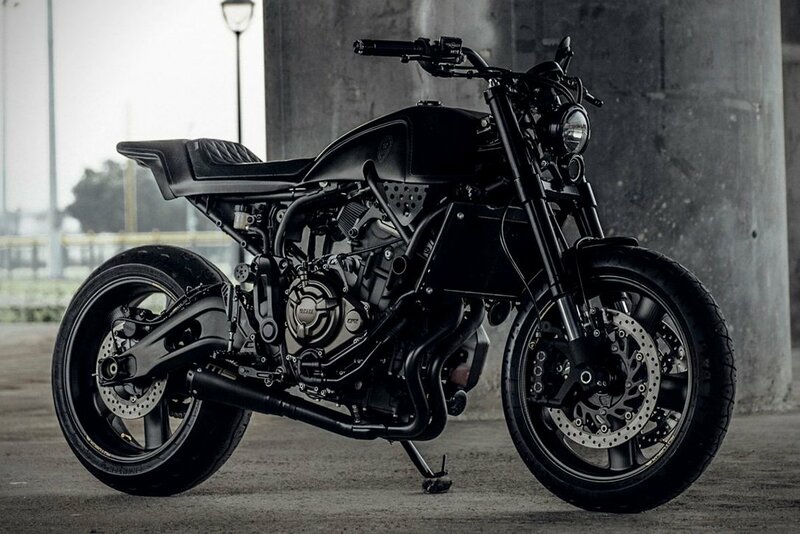 Cue the Flying Phantom by Rough Crafts, a motorbike that even Batman would be proud to own! Built with the brand’s first production sample of the “FasterXSR” kit they created for Yamaha, the XSR700 Flying Phantom’s name derives from the pair of Pirelli Phantom Sportscomp tires on which it sits. The awesome bike has also been fitted with a CNC billet “8” headlight and a titanium tailpipe; Beringer Brakes hand controls; Gears Racing rear shocks; Motogadget grips; a mirror and turn signals. Apparently, 400,000 pick pocket incidents occur everyday worldwide. Shocking right?! We;ve all been warned aout pick pockets before visiting big cities and touristic areas. “Watch out for your purse, make sure your bag pockets are closed well, latch on to your camera strap”… And while that advice is always well placed, constant travelers like us would much rather enjoy a trip without worrying about being robbed. That’s where the Antonio™ Anti-Theft USB Charging Travel Laptop Backpack plays its role. 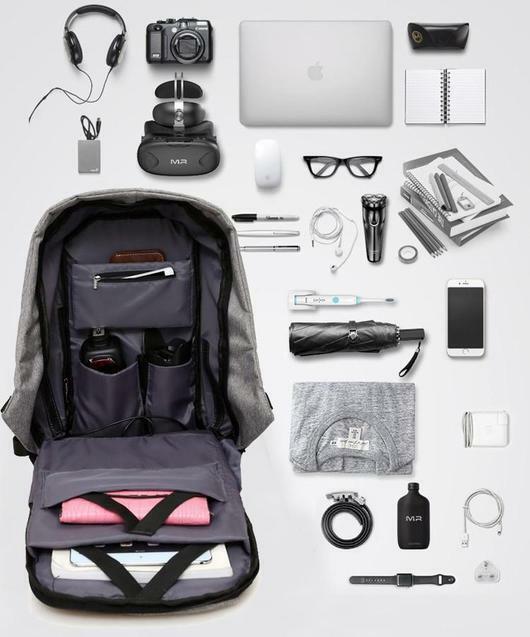 This ingenious backpack features hidden anti-theft zippers and more than ten compartments, including two interior computer interlayers with elastic straps, a cellphone pocket, zipper pocket and slot pocket, pen loops, a quick access card pocket on the shoulder strap and more. You can even pair the built-in USB charger port with your favorite portable charger (not included) to power your devices. Tear-resistant, water-resistant fabric gives it a nice look and keeps it ergonomic; carry it comfortably and safe keep your stuff! Retro is all the rage! Mix it with technology, and you’ve got yourself one cool piece of tech! Since typing on a computer has overtaken writing, here’s a tool to be a cool typer and show off at the office: the Azio Vintage Keyboard. Its top plate is made from genuine leather and framed with a zinc aluminum alloy that will weather and gain character over time. Inspired by vintage typewriters, the key switches are quite “clicky”. 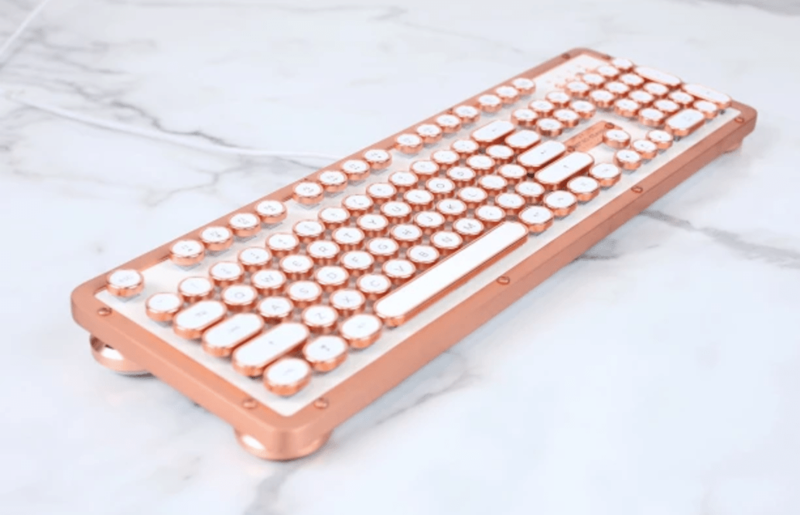 The keyboard comes in three “vintage-y” color schemes -artisan, onyx and posh- and can be linked to a laptop or computer by USB or Bluetooth. 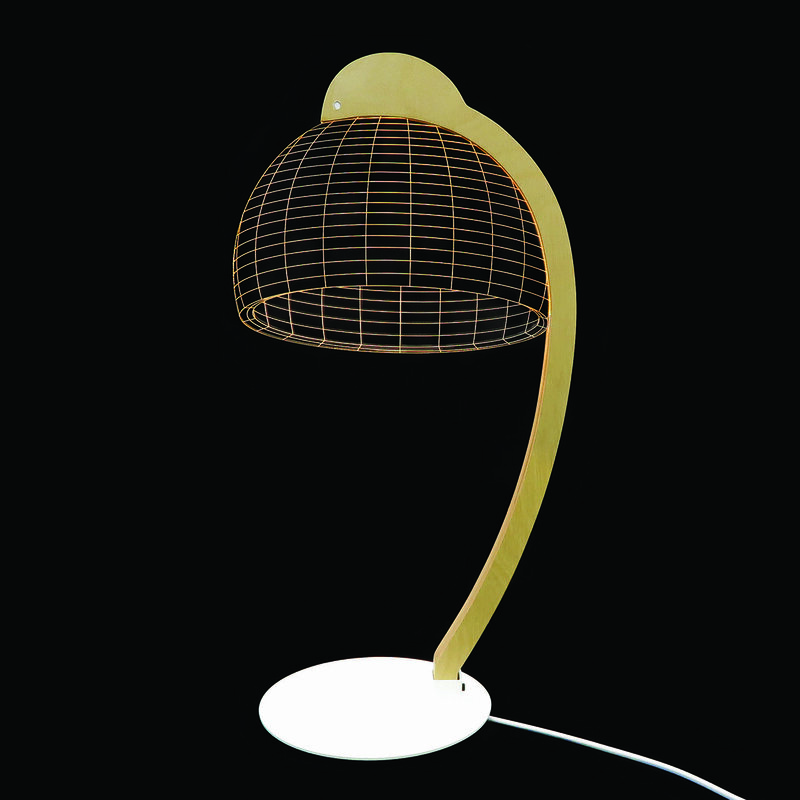 This high-end lamp is a piece of contemporary art! Not just because it’s insanely creative and has an odd design, but because it’s actually also distributed at the New York MoMA! Sleek, simple, stylish, 3D. These lamps boast playful optical appeal and function like a desk lamp, or can be used as a night-light when the built-in dimmer is applied. When illuminated, LED light travels through the lines revealing its unique 3D design effect.